Katina refers to the offering of a special robe (katina civara) carefully prepared by pious laity and presented by them to monks who have completed the three-month period of retreat called Vas in Sinhala and Vassana in Pali (literally, ‘the period of rain’). Katina literally means ‘firm’ or ‘solid,’ as the offering of a Katina robe helps one to earn good, solid karma. The Katina Ceremony has a history spanning more than 2500 years. A special element of the Katina robe offering is that it is not offered to an individual monk, but to the entire community of Sangha; to all noble disciples of the Buddha -- and not only to enlightened ones, but also to those monks yet to be enlightened. The Katina robe can be offered only during a specified period at the end of the rains retreat, between the full-moon day of October and the full-moon day of November. It is a monastic tradition long preserved and observed by Buddhists all over the world, and is highly revered as a unique, once-yearly opportunity to acquire merit. 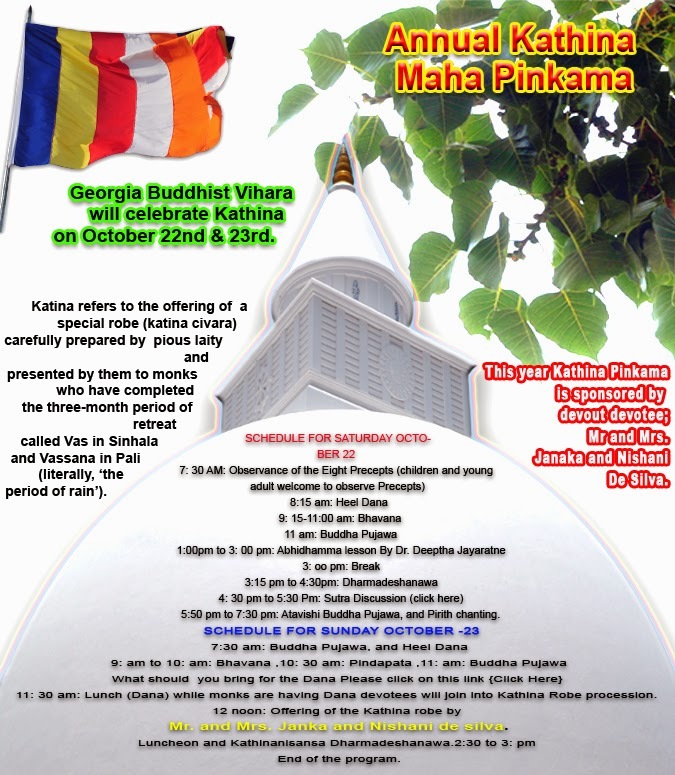 Georgia Buddhist Vihara will celebrate Kathina on October 22nd 23rd. ( below is the full program)This year Kathina Pinkama is sponsored by devout devotee; Mr and Mrs. Janaka and Nishani De Silva. You are invited to attend this meritorious Pinkama. 5:50 pm to 7:30 pm: Atavishi Buddha Pujawa, and Pirith chanting. 11: 30 am: Lunch (Dana) while monks are having Dana devotees will join into Kathina Robe procession. 12 noon: Offering of the Kathina robe by Mr. and Mrs. Janka and Nishani de silva. 2:30 to 3: pm: End of the program.